Joes Racing Products 10704-G Steering Wheel Hook. 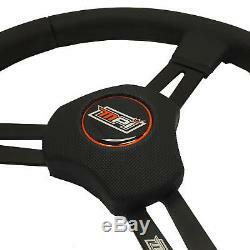 Sprintcar Dirt Late Model Steering Wheel by MPI®. Dirt-style finger bumps indentation on entire steering wheel back. All MPI wheels are designed and engineered in the USA and built in ITALY using the latest steering wheel technology and state of the art materials. MPI prides itself on several wins in CUP, NW, Truck, Late Models, Legends and local races. Sprintcar / Dirt Late Model concept specific Aluminum structure Dirt-style. Most Items Delivered in 3 Days or Less. See below for full details. Sprintcar / Dirt Late Model concept specific Aluminum structure Dirt-style finger bumps / indentation on entire steering wheel on the back. Hole pattern: 3 hole (NASCAR Style). Extended padding on spokes for increased protection. STEERING WHEEL STRUCTURE The U-CHANNEL + SINGLE RIVET construction has been the standard in the racing steering wheel industry for years. At MPI we innovated the process with our MPI-DW2R technology; adding wings to the spokes and utilizing a 2 rivet construction, to increase durability, ensure the most uniform distribution of load under impact, at the same time reducing structural weight, while maintaining highest standard of safety and solidity in the industry. Some companies like to weld their spokes to the U-channel or use a one rivet construction process. Why dont we do this? Welding these 2 highly important components of the steering wheel structure or using one rivet is a quick way to build it. In our opinion, taking compromises on reliability and safety over production is not the way to provide our customers with the best. GRIP and COMFORT -- A. T - ADVANCED MOLD SHAPING TECHNOLOGY We shaped the wheel based on the natural contour your hand forms when you make a fist. That is why the oval grip shape feels so steady and firm when you hold an MPI product. That is also why we changed the grip for each product depending on if its built for a younger audience (our karting and Legends wheels) or for an adult audience (our MP, LM, and D models). MPIs continued research on material resulted in a very unique formulation of our polyurethane foam which is the soul of what you grip while driving. Hours have been spent with pro drivers like Kevin Harvick and Jimmie Johnson testing different densities to find what gave them the best feeling and performance. This is why your hands are holding the best on the market. 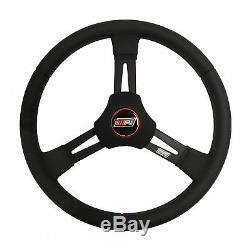 JOES Racing Products Steering Wheel Hook Included. Similar to a helmet hook but big enough to hold the steering wheel. Optional reducers are available to adapt the 1-3/4 clamp to fit roll cages made with smaller tubing. As with any electronic item, additional installation parts may be required to complete installation. Please message us for details. All Sales final on Racing product once the item has been opened or wrapper removed. We want you to get your item FAST. For most orders placed Monday through Friday before 1pm EST we are able to get your order out the door that day. Your satisfaction is our top priority and we'll strive to make sure every customer is 100% satisfied. We are committed to providing you a quality product at the lowest prices possible. We also realize that the quality of the customer service we provide you plays hand and hand with the product you receive. Any defective item may be exchanged for the exact same item. Items without a return authorization number clearly marked on the outside of the package will be refused. We hope you feel comfortable with our policies, as we have done extensive market research and have continuously upgraded our policies to make our customers shopping experience the best it can possibly be. We do not allow local pick-ups or drop-offs. No third party billing offered. 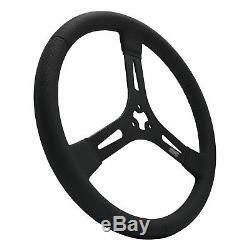 The item "MPI MPI-D-15-A Sprint/Dirt Late Model Black 15 Diameter Steering Wheel" is in sale since Tuesday, June 19, 2018. This item is in the category "eBay Motors\Parts & Accessories\Performance & Racing Parts\Asphalt Oval Racing Parts\Quarter Midget/Micro Stock". The seller is "race_choice" and is located in White Plains, New York.